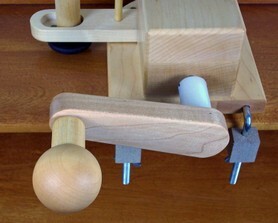 The Heavy Duty Ball Winder uses a high performance wooden handle. This handle gives the user tremendous leverage and makes winding more enjoyable than previously available on a ball winder. Be sure you tighten the set screw on the handle so that it is secure on the 3/8" or 10mm (newer) steel shaft. The ball on the end of the handle rotates freely in the user's hand. This makes it very easy to turn. This ball handle is referred to as the Ergo Handle because it is very ergonomic. You can approach the handle from any direction and when you grab the ball in your hand, it allows you to transfer energy to the handle at any angle. You will see what we are referring to the first time that you use it. You can rotate the handle in either direction. You can rotate the handle at any speed that you like but we would suggest that 2 revolutions per second is normal and 3 revolutions per second is very fast. The unit can accept whatever speed you want to use. Everything about the ball winder is heavy duty. 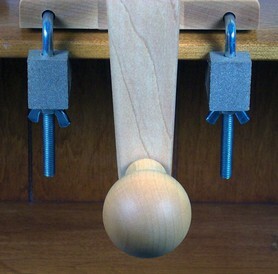 The handle is just one part of the system but it is the part that you will touch each time you use the ball winder. Be sure to clamp the unit down to the table using both clamps. The centrifigal force that gets generated when cranking the handle at high speed is tremendous and you do not want the unit to accidentally move off of the table.